Als freelance drummer speel ik live en in de studio drums bij onderanderen: La Boutique Fantastique, Mieke van Veen, en Woof Woof Ridicule. Ik heb samengewerkt met: Pete Philly, Budy Mokoginta, GMB, DJ Luna, DJ Joost van Bellen, en meer. 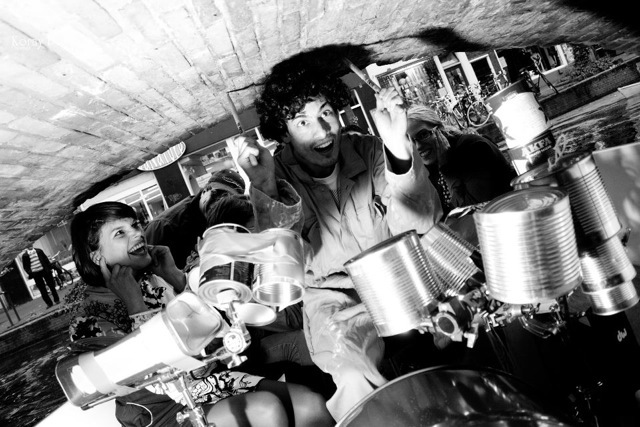 Ook doe ik solo experimenten en performances met drums in combinatie met electronica en video. This entry was posted in Drummen on 15 October, 2011 by Jornt. Gotye “Somebody that I used to know” cover. This entry was posted in Drummen on 5 October, 2011 by Jornt. 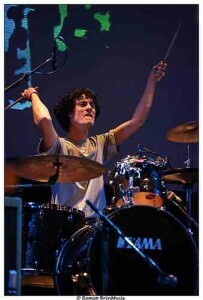 I did a drumming performance for the opening of the Blikopener festival 2011. Blikopener is dutch for can opener so made a drum kit oud of cans and played rhythms on it sailing on a boat thru Delft. It was great fun as you can see. And I kept the big oil drum this will come in handy in future music projects! This entry was posted in Drummen on 26 August, 2011 by Jornt. De Wereld Draaid Door, is one of the best viewed shows on the Dutch television. The show is broadcasted live from monday till friday. The shows subject is news orientated it can vary from the death of Bin laden to the smartest boy of Holland and so on. Every episode a band performs just one minute of a song, not a big deal but the show has about 1,5 million viewers in the Netherlands and thats a great figure for a show in this small country. Before the show airs the band is given the opportunity to play one whole song for the website. We played the song “Schoolyard” enjoy. This entry was posted in Drummen on 28 April, 2011 by Jornt. 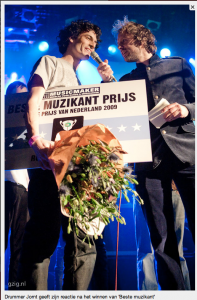 Last night I won the price for best musician 2009 at the Grote prijs van Nederland! Pretty cool, it’s nice to win a prise of course and I can take some more money to Bali for my research. This entry was posted in Drummen on 11 December, 2009 by Jornt. I’ve recorded some drums on the tracks of a friend of mine Martha Jane Satler for her project 365 mornings. The studio was great and the musicians even better. This entry was posted in Drummen, News on 29 March, 2009 by Jornt. Video drumming solo for Prix du Port. The theme was wather so I shot some video audio samples of wather. This video was shot during the first round I got second place in the finals. This entry was posted in Drummen, Video Drumming on 15 May, 2007 by Jornt.